Discover Personalized Gifts by Viktor&Rolf fragrances. Share a true moment of beauty and delight with each gift wrapped inside an iconic Viktor&Rolf gift box. Make treating yourself and others an unforgettable experience with Personalized Gifts by Viktor&Rolf. Each gift is delicately wrapped in black silk paper in a signature Viktor&Rolf white box – embossed with the iconic black wax seal. With each order, receive 2 complementary samples of your choice to further discover the magical world of Viktor&Rolf fragrances. Customize your bottle, exclusively on the Viktor&Rolf online boutique. Choose the color of your Flowerbomb bottle, dress it up with an accessory and engrave it for the final personal touch. Give your fragrances a personal touch with an engraving, available for Flowerbomb, Bonbon, Spicebomb and Magic bottles. Enjoy free UPS Standard Shipping (3-5 business days) on all orders of $75 or more. Express Delivery is also available. 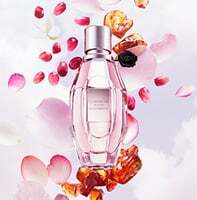 For each order, 2 complementary samples are offered to further discover the magical world of Viktor&Rolf fragrances.